On New Year’s morning, have the coffee brewed, the cups warmed, the fire started, and the music on low. 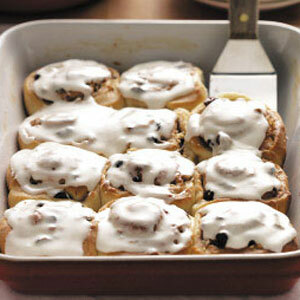 A quilt, a couch, some friends, your family and these cinnamon rolls are all you need to start the new year off right. You can make these the night before and then bake them in the morning. Combine the milk, oil, sugar and salt and heat until warmed to 105-115 degrees F. Then dissolve 3 packages of rapid rise yeast in approximately ½ cup warm water. When milk mixture is heated, remove from heat and add 2 eggs, slightly beaten. Then add the dissolved yeast mixture. Add about 3 cups flour and stir dough until it becomes elastic. Stir in 4 more cups of flour. At this point the dough should pull away from the sides of the bowl and form a ball. If need be, you can add a little more flour. Let the dough rise until it nearly double in size. Remove from bowl. Knead on floured surface for about 10 minutes. For cinnamon rolls, roll the dough in a rectangle that’s about 18 inches by 12 inches, and about 16 inches wide and 1 ½ to 2 inches thick. Sprinkle the mixture of brown sugar, raisins, ground cinnamon, salt and melted butter of the surface leaving a ¾ inch border along the top edge; gently press the filling into the dough. Beginning with the long edge nearest you, roll the dough into a tight role. Firmly pinch the seam to seal and roll the seam side down. Very gently squeeze the roll to create even thickness. Using a serrated knife, slice the cylinder into 1 ½ inch rolls; yielding 12 rolls. Arrange rolls cut side down in a greased baking dish. Let the rolls rise ½ hours before baking. Bake at 350 degrees for 25 – 30 minutes until golden brown. Frost with powdered sugar or cream cheese frosting and serve. For dinner rolls, pinch off dough into 3 inch balls. Place on a grease cookie sheet. Let rise for ½ hour and bake at 350 degrees for about 20 minutes.